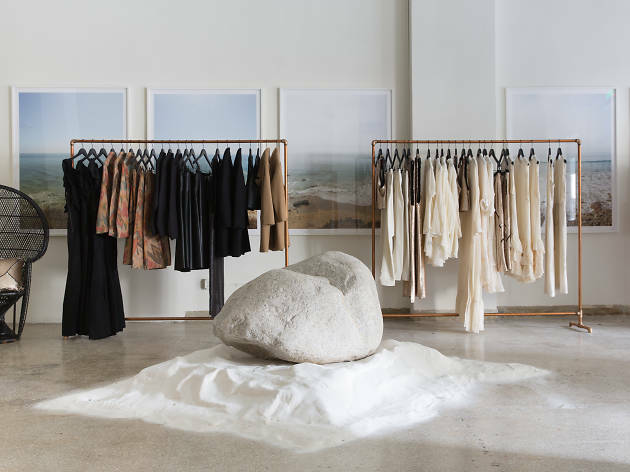 SoCal designer Merrick's first storefront contrasts her ethereal dresses and luxurious home wares with a design that emulates the rugged Callifornia landscape. 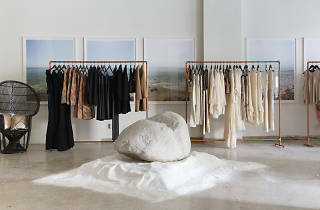 At the center of the space sits a large sand-and-rock art installation by Merrick's friend, French artist Josephine Wister Faure, and the walls are lined with custom surfboards shaped by Merrick's brother Britt. The shop serves as a functioning atelier, with a drafting table, bolts of fabric and on-site tailoring; there are also rotating art installations, live acoustic music sets and a local succulent market.